Last known price is 100% above the initial Lego retail price! The Winter Village Market (10235) Lego set is no longer directly available from the sites below. However, 3rd party partners of these sites might still have the set available. 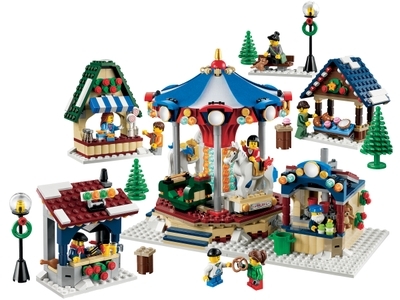 Alternate description Create a seasonal scene full of fun with the Winter Village Market’s rotating carousel, rocking horses, food stands and 9 minifigures! Watch the carousel horses really rock! Fill up on holiday treats at the bakery, grill and candy stands! Combine with 10229 Winter Village Cottage for an even bigger winter scene!